Long story short: The highest-rise building in the city boasts some desirable serviced apartments. The view from the 74th floor already feels fairly regal, but – and way to make a boy feel special here – it gets even better as the concierge tells me that there’s only one person in the city with a bedroom on a higher level. That would be my upstairs neighbour, and the owner of Meriton World Tower, Harry Triguboff. Given that he’s the richest man in Australia, and I’m not even in the top ten richest people in my family, it feels like quite the honour. I guess I won’t make any formal complaints if he’s throwing a rave up there at 4am. It’s his penthouse, after all. 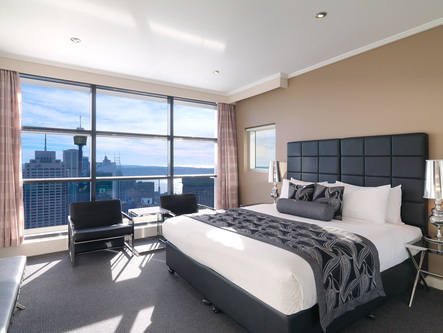 Serviced apartments come in many guises, but not many as swanky and literally panoramically impressive as those at the Meriton World Tower in downtown Sydney. At 75 floors, it’s the tallest residential building in town, and the building cuts a vertical swathe through the central business district. Checking in, I get a fair look at the cross section of fellow residents: rich Asian kids who barely look up from their smart phones as they mosey around, large gaggles of Saudi families and young mothers carrying one part designer-clad kid and one part unfathomably expensive handbag. A bachelorette party excitedly waits behind me, but they’re as incongruous as I am. All the apartments are situated above the 61st floor, meaning you can’t go wrong for views. The rooms are huge, and I feel like putting on the Best of Phil Collins as I look out over around 75% of the city skyline from my corner pad, all the non-sinister Patrick Bateman fantasies coming true. The décor is simple but stylish, the living room feeling so open plan it’s ridiculous and with a choice of three bedrooms complementing the fully-equipped kitchen and utility room, I wish I was here for a month so that I could fully exploit all of the spaces. I don’t even have enough friends in Sydney to fill the long dining room table. The views are insane. I know that’s a reductive description, but it’s hard to convey any other way. Sydney isn’t the most high-rise city, so the full sweep of downtown spreads out underneath you, out to the suburbs and beaches. Later that night, I sit mesmerised as a lightening storm rolls in, a front row seat to a dramatic, HD and full Dolby light show. OK, so there’s no restaurant, but you’re in the middle of the entertainment district, so you can have pizza delivered or walk to high-end dining. The pool and gym are of course as well-appointed as the rooms and offer similarly distracting views. There’s on on-site supermarket and excellent (and cheap) coffee shop just off the lobby on Liverpool Street. My only real complaint was that it was barely possible to get any work done because you just want to stare out of the windows all day, pretending to be a benevolent oligarch or a super hero or a lucky travel writer who the night before was tossing and turning on a single bed in a hostel with not even a kettle in the room. Outside of the other great facilities here, I’m at least assuming that if I run out of milk in this apartment, I can just wander upstairs to borrow some from Mr Triguboff. Champagne tastes: The penthouse suites will run you from around AUS$1,695 a night. Shandy Pockets: You can check into a 'Soho Apartment' for less, though given the large Penthouse Suites sleep 6 people comfortably, they become a bargain if you can organise a group. There's also free high-speed wifi. 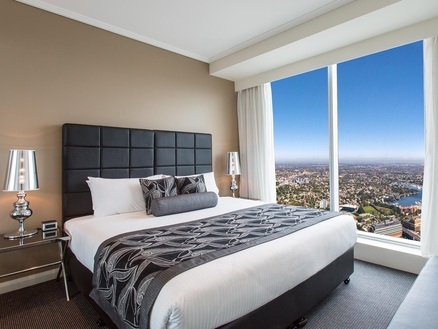 Review by Paul Oswell, who was a guest of Meriton Serviced Apartments.